The crown jewel of small business loans are SBA loans, but the qualification requirements are high and approval process is slow. In addition, most SBA lenders require two years of operating history to even consider lending to a business. For business owners that are looking to grow quickly, waiting 2 years to take out their first business loan is not an option, so they pursue other options. When should you refinance debt? Your business is going to raise funds through an equity round. Investors want to see their investment go to growth, not debt servicing costs. Refinancing debt can make your business more attractive to investors because lenders will have just verified that your business is worthy of investment. During a period of strong revenues and profitability. Many business owners wait until they need capital to take out a loan, but this often falls after a period of slower revenues. This makes the loan more risky to banks and will increase likelihood of being declined. At the very least, you will get worse rates than if you apply for a loan with strong cash flows. When your credit score increases 50+ points since your last loan application. If your credit score improves substantially, there is a chance that you are eligible for refinancing. Be strategic with how you find loans and when you decide to refinance. Refinancing when your credit score has improved will likely help you get a combination of more capital and lower interest rates. Too many hard credit pulls will knock down your credit score. Instead, engage an online lender who can help you narrow your options and prequalify you for approval. They can also help you identify key credit score breakpoints in which you are eligible for high quality loans. When your business has uncollateralized assets. While collateralizing personal assets is generally inadvisable, business owners should leverage their business assets to get access to loans. Many small business owners start with small lines of unsecured credit. As their business grows over time, the bank is willing to increase that unsecured line of credit. Most businesses will also have a higher dollar value of assets as they grow. By refinancing your loans into secured products, you will be able to reduce the interest rate and improve margins. When your business would qualify for an SBA loan. SBA loans are often the cheapest option for business owners. The federal government guarantees 50-90% of the loan, reducing the risk exposure to the lender. This allows the lender to offer you rates as low as prime + 2.75% and dollar amounts up to $5MM. These loans are highly competitive, and have the strictest underwriting requirements on the market. After a past bankruptcy or loan default drops from your credit score. Your creditworthiness will be damaged for seven years following these events, at which point regulations require that the information no longer be listed. If you applied for loans while the bankruptcy was still on your credit report, it is best to engage different lenders. Despite the bankruptcy being dropped from your credit report, the lender will have your bankruptcy on their personal file as the reason they rejected you for a loan the first time. After you bring on a new large equity shareholder in the business with a good credit score. Lenders will typically want to see more than 50% ownership of the business guaranteeing the loan. By having more than one cosigner on the loan, the bank can spread the risk among multiple individuals. If your business partner has a better credit score than you, this can help increase your chances of approval. 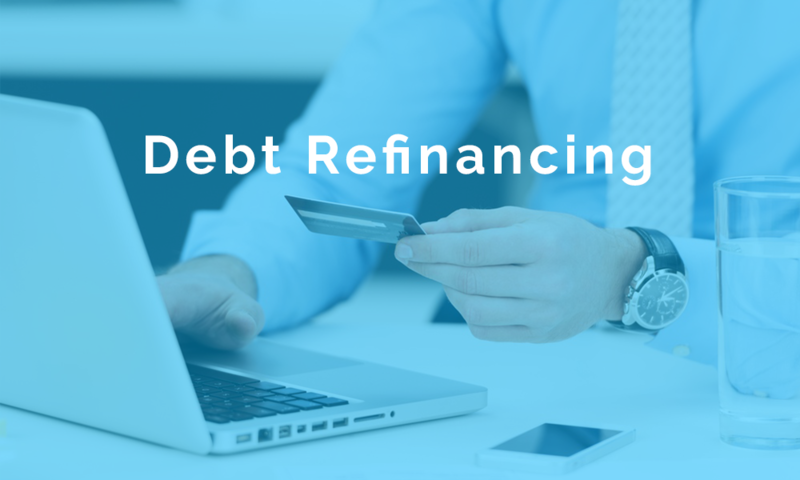 Refinancing debt is a critical part of running a small business. By knowing the trigger points that make refinancing possible, you can reward your shareholders with lower costs and better returns.